Some women like shopping for shoes, I like shopping for tires. So much so that I have a spreadsheet on my computer that I use to figure the approximate outside diameter, based on the tire size. Very important when trying to figure the right “rubber rake” on a hot rod! 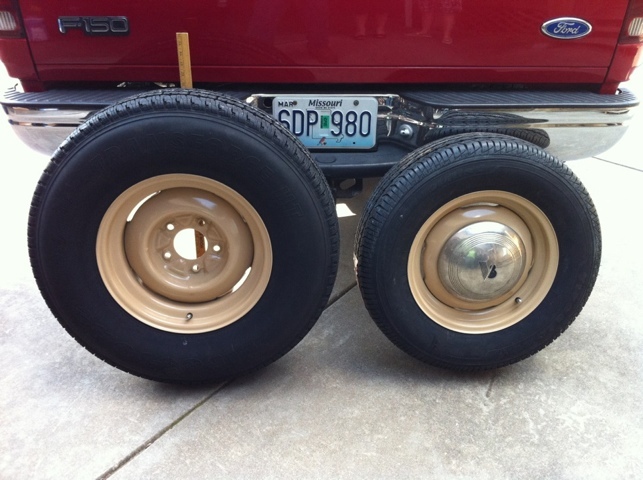 With the ’40 Stake bed, my original intentions were to use the “stock” ’40 wheels, but I couldn’t find any tires that I felt safe putting on a wheel that was only 4 inches wide! I wound up buying a set of Wheel Vintiques “Gennie” series wheels. I had decided to get 16″ wheels all the way around, but then had buyer’s remorse on the fronts, thinking that I should have gone to a 15″, due to the fact that tire sizes for 16’s leave very little choice for the “littles”! After getting all 4 wheels, I dropped them off to Mark Lewellen, over at Springfield Powder Coating. He had them blasted and coated for me, using a color that the book called “Caramel”. It appears to match fairly closely to the 1Shot Lettering Enamel color “Camel”, so it should look good when the truck finally gets striped! On to the tires. Since the truck has a stock set of 3.78:1 gears in the back and an original 221ci flathead, I wanted to make sure that I got tires that would be tall enough to go down the road at 65MPH and not have the flatty screaming! One tool that I use is the RPM Calculator at Randy’s Ring & Pinion web site. Working backwards, based on trying to shoot for a 2500 to 2800 RPM range, I began plugging in numbers to determine how tall of a tire I needed to find! After quite a bit of noodling around, I had decided that a 235/85r16 was the “magic” tire, with about a 7″ tread width and 31.7″ tall. I chose the Firestone Transforce HT’s for the back. I can’t remember which Firestone we put on the front, but I’m having second thoughts about them. They are 215/70r15’s, and the tread on them are darn near as wide as the backs. I did find some 185/80r15’s that are about as tall, but quite a bit narrower, and I just may buy those and use the 215’s on the front of the ’54 F100! With tires that tall in the back, I have decided to use the original spring out of my ’40 coupe, which should drop the back end down an inch or two, which will help level out some of the additional rake due to the tires being so staggered. Anyway…the picture of the tires are from when I unloaded them after picking them up at the Mitchem Tire. The cap is one of the original caps from the truck. I am going to use them on these new wheels! Tonight, I am going to try and keep my attention on the wiring and get as much of it done as I can. I have several items on my “shopping list”, including a headlight switch and a new fan belt. I need one a little longer, due to the alternator sitting a little higher than the 6v generator did. Hopefully I can find one that will work at the farm supply store!